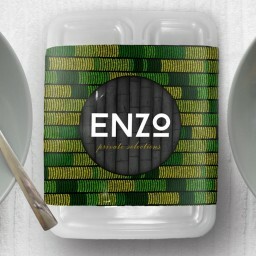 Quality, recyclable and durable lunch box. 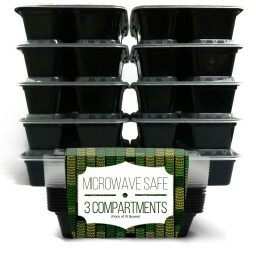 MICROWAVABLE and DISHWASER safe; can withstand temperatures up to 230 F. Easy to use and easy to clean; Freezer Friendly! Perfect for your life on a go! THICK, 3 COMPARTMENT MEAL SAVERS - These food storage containers nest together to save space when not in use; durable, practical, and convenient. 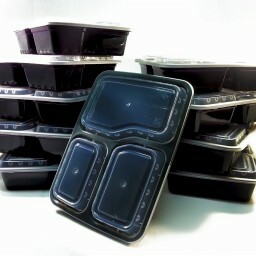 ideal for food preparation and to store leftovers; great for take-out orders and pre-packaged meals ; freezer to microwave real food; RECOMMENDED for appetizers, salads and entrees; great containers for everyday use; SPACE SAVERS! NEW & IMPROVED LID - fits and secure lock ensuring that no messes or spills occur. Keeps delicate ingredients like fruits or vegetables fresh and contained. 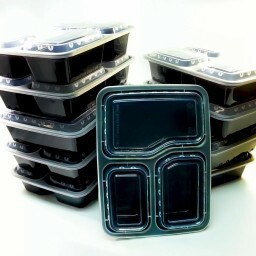 SALE PRICE EXCLUSIVELY ON AMAZON - Get package of 10 packs of 3 compartments food grade meal containers/food savers with clear airtight fitting lids for a great price. Limited time only! Valued over $27! ENJOY OUR 100% RISK FREE MONEYBACK GUARANTEE - We are so confident you'll love our Food Containers, if you're not completely satisfied simply let us know and we will ensure your absolute happiness!